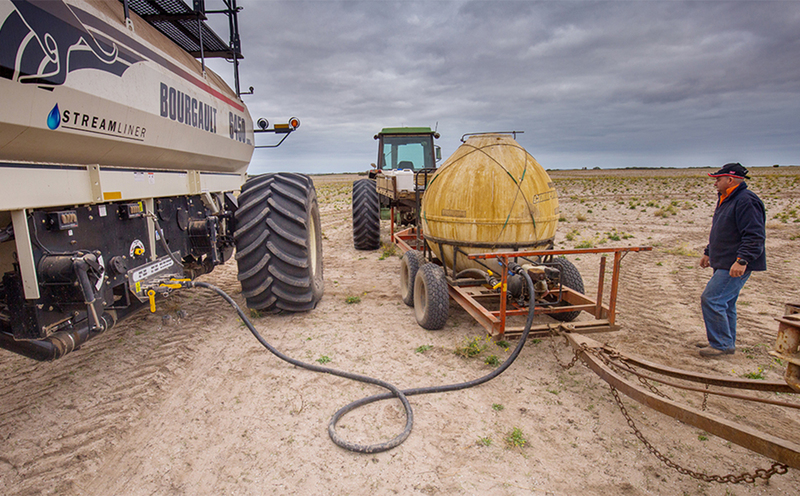 Manganese-deficient soils on a Yorke Peninsula property are receiving the nutrient boost they need from liquids placed up front with the seed. For Yorke Peninsula farmer Michael Shepley injecting liquid trace elements has made a significant difference on his property’s manganese deficient calcareous soil. PROPERTY: 3200ha, cropping wheat & barley, plus oats for stock feed for their sheep enterprise. Huge Savings* – DAP plus liquid trace elements less expensive than SAP option. The South Australian mixed enterprise farmer, who fitted Liquid Systems (SA) equipment for the 2017 season, said his crops were still thriving 13 weeks after seeding, even though rain delayed his foliar spraying program by four weeks. “I think if we were without liquid in some of that country, we would have been in quite a big mess,” he said. Michael, who crops 1600ha of wheat, barley and oats at Corny Point with his wife Kate and parents Dean and Heather, purchased the Liquid Systems (SA) AI 120 equipment in August 2016, soon after upgrading to a 14.8m-wide Bourgault 8910 seeder bar and 6450AU air cart. During 2017, the Shepleys applied the trace elements zinc, copper and manganese, together with the fungicide Flutriafol and Supa Link, which solves any chemical compatibility issues. Manganese-deficient soils affect three quarters of the Shepley’s cropping country, with light-coloured, limp leaf symptoms leading to reduced yield potential. The problem is most evident in their calcareous Mallee country. ABOVE: Liquid stream from friction tube terminal assembly. He conducted a trial last year by stopping the liquid application on a 400 metre-long strip at the end of a barley paddock. “That was on Mallee country, which is hungrier manganese ground. Signs of deficiency showed up all the way through the strip and we had to spray after only five or six weeks. It was terrible,” said Michael. “There was an obvious visual difference between the trial strip and the rest of the paddock.” While the subsequent yield was “slightly less” from the liquid-treated strip, another trial Michael conducted on wheat produced results that were 800kg/ha better with liquid compared to an adjacent strip. Dean agreed that the 2017 season showed crop improvements. “I don’t believe we’ve ever had a more even year – and that’s over every paddock – than we’ve had before. There’s always been an issue somewhere on the property and last year was very, very even.” he said. I don’t believe we’ve ever had a more even year – and that’s over every paddock – than we’ve had before. There’s always been an issue somewhere on the property and last year was very, very even. 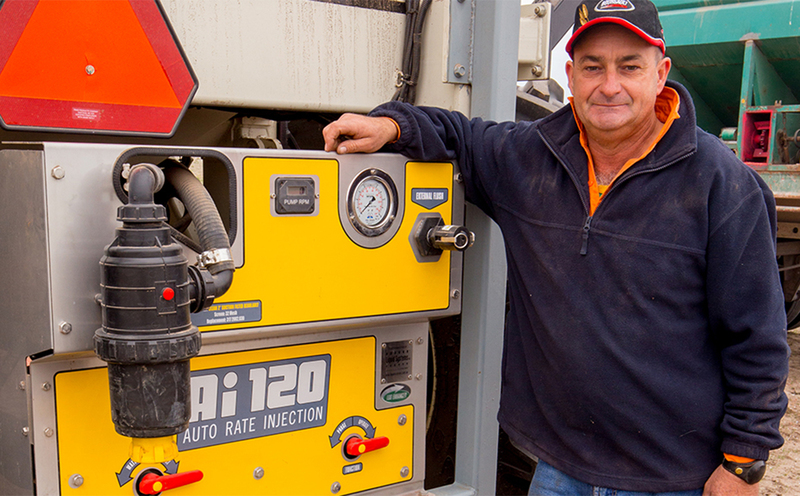 The Shepleys have been impressed with the simplicity of the Liquid Systems (SA) equipment, especially the set-and-forget liquid rate control. “My neighbour has to tinker with his liquid injection set up. He watches every load and manually adjusts the flow rate. Whereas we set this up and then don’t have to touch it again,” said Michael. In addition to the Liquid Systems (SA) equipment, the Shepley’s purchased a second-hand 2000L Jetstream boom sprayer, which they converted to a batching plant. They removed the booms and added a pump and aluminium tray to hold the bags of magnesium and zinc. The Jetstream’s capacity allows them to batch up enough liquid to cover 40ha. ABOVE: Michael transferring liquid from his converted boom sprayer, 2000L tank to his air cart. Next seeding they will use a second-hand 7000L Flexi N tank as a cartage tank. Michael said the extra storage capacity will allow the family to prepare up to 6 batches, enough for at least two days of seeding. In a 40ha batch, their trace element mix includes 4kg of copper sulphate, 125kg of zinc sulphate and 100kg of manganese, plus .1% Supa Link. The Shepleys have also purchased a John Deere 9320 tractor with 375 horsepower to better handle the adapted seeding rig, which will allow them to carry the full 4500L capacity of liquid on the rig, rather than 2000L. It’s about $5/ha for liquid sulphates versus about $30/ha for SAP. So, it’s $25/ha less for liquids and we’re putting more product on. ABOVE: A120 (126L/min) Pump & Control Module is neatly mounted on the back of the Bourgault 6450AU Cart.